Today is Ash Wednesday, the beginning of the Lent Season. Yesterday was “Shrove Tuesday,” or “Fat Tuesday” – the last chance for many to feast and party, before the sombre Lent season commences. IHOP offers free pancakes to everyone. Carnivals and parades pop up here and there, especially New Orleans. Why such a contrast? 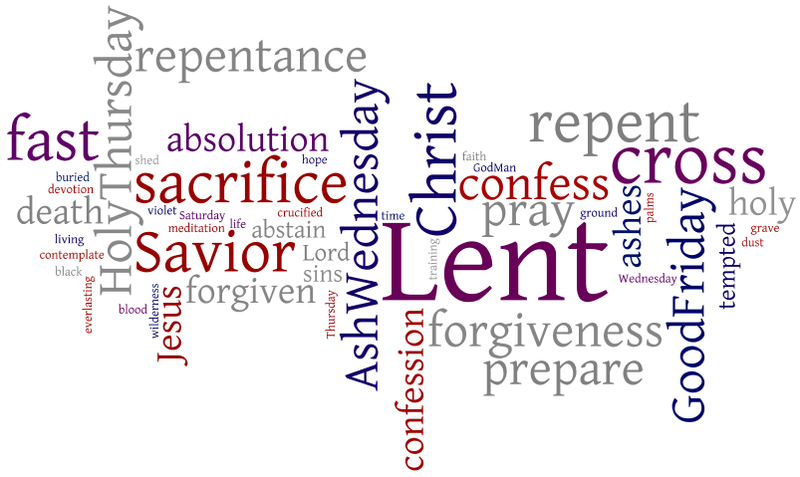 Traditionally, Lent is understood to be about self-denial and purification. It is modeled after Jesus’s 40 days of fasting in the desert, where He confronted and overcame temptation. Similarly, many Christians use the 40 days leading up to the Easter week as a time of self-denial, or fasting. Given the nature and length of Lent, it is understandable that it’d be preceded and followed by feasts! But why fast, in the first place? God has given us the Disciplines of the spiritual life as a means of receiving His grace. The Disciplines allow us to place ourselves before God so that He can transform us (7). Practices such as reading Scripture and praying are important—not because they prove how spiritual we are – but because God can use them to lead us into life (39). 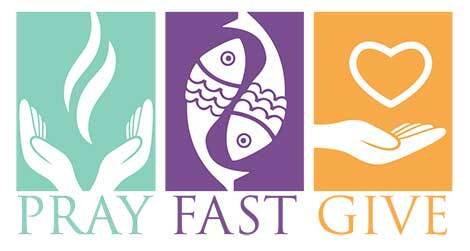 So then, Lent offers us a yearly opportunity to do something together as Christians: to fast, to deprive ourselves, to give up something, in order to create space for God to fill. What could that look like? The first time I remember participating in Lent was when I was a teenager. Even then, I think the meaning was clear to me – give up something that is in the way of your relationship with God. So, this was reactive. Yet, even a reactive fast can be proactive, in that it creates space for something better. I decided to give up TV. At my home, there was often a TV on, somewhere. There was also a computer screen or two, or three. I’m not saying that my family was unhealthy – we were outdoorsy, and ate meals and prayed together. But for me, the TV was taking up too much space in my life. I knew it, deep down. Through that month, I overcame many awkward and isolating situations, and emerged a different person. My appetite for TV had shrunk. After a while, I stopped missing it. My head was clearer, my mind was freer. Many years later, as a young father, I had time to reflect on my busy life during a 16-day road trip. We lived in an apartment with two children (and another coming soon) while I served as pastor of an inner-city multicultural church. As we often do on vacations, my wife and I agreed to make adjustments to our home life, to make it healthier and more sustainable. For me, I decided to give up something new – every month. What a fascinating experience. It seems so daunting beforehand, so agonizing in the process, and so freeing by the end of it. In September, I gave up pictures. Having frantically tried to capture every beautiful sight and memorable moment during my road trip, I began to feel like moments and sights had become commodities, or objects for me to ravenously consume, to frantically collect. I wondered – “what if I just experienced moments for what they were, letting them pass into my memory?” It was a freeing experience – and I learned to be more attentive. I learned to appreciate things and let them go, to find intrinsic value in a moment, without the extrinsic benefit of stored images. Next, it was coffee. This was a hard one. My body and mind groaned for caffiene in the early days of October, and I tried to fool it with decaf and tea. I cheated a little, and learned the gravity of the situation. I do not want to be addicted to something, like this. In November, I targeted sports media. Now, that may or may not sound like a big deal. But, perhaps everyone can compare it to something – social media, the newspaper, romance novels…whatever you fill your gap-time with. I tended to check sports scores, news, and highlights whenever I could – waiting at the microwave, on the toilet, on the bus, at a red light, at a playground, in a lineup, or even while waiting for another page to load. Through this fast, I began redeeming the value of gap-times. Our bodies need time to breathe; our minds need time to think; our souls need time to pray, practising the presence of God. Now, it’s March 1, 2017 – here we go again! Lent is beginning, and so is a new month. Why not prayerfully reflect on what could give way in your life, to make room for God? Is it a “sin that entangles?” Repent of it! Is it “anything that hinders?” prune it away, so that fruit will come! For me, I’ve cut my phone data, and have restricted its internet use to Google Maps and News. Perhaps that seems like nothing, but for many, a phone threatens to become everything. Its “capabilities” can actually enslave you, by making you feel that things that would normally be done later, elsewhere, should be done here and now. Ironically, then, greater ability means less freedom. With a smartphone, I feel that I have no excuse to not respond immediately. I have endless temptation to remove myself from the moment, and dwell in cyberspace. For March, my phone is no longer “everything.” It’s capabilities are limited. It is a phone, a reader, a music player, a map, and a newspaper. And, I’m glad – these capabilities enable me to more efficiently do what I would need to do anyways. But as for email and social media, they can wait. I don’t need to operate them via a mobile device. Their place in my life will be my stationary computer. Why? What’s the harm? First, many smartphone capabilities are passive – there when you need them, and invisible when you don’t. But, mobile email and social media tend to be more active – they send us instant notifications as messages come. They make us available to be reached by new means. Like phone calls, they can intrude and distract. And for me, I’m deciding to assign them a limited place, and make them once again passive – there when I want them. My hope is that the new space this creates will be filled with a greater sense of God’s presence, listening through Scripture & prayer. Secondly, the capability to respond instantly via mobile email and social media opens up new risks. How many rash and regretful messages would you like to take back? How could waiting a while have changed their tone? How many long, rambling emails “should have been a phone call”? 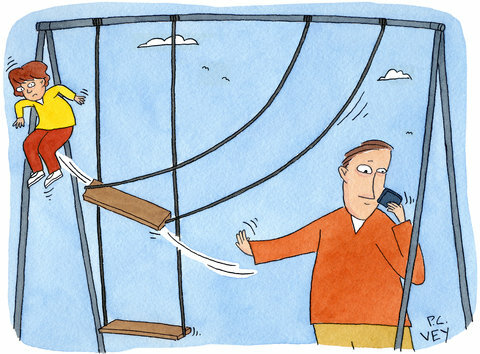 How effective can communication be through email and social media, anyways? Email and social media still have their place in my life. Email is helpful for conveying written information clearly, thoughtfully, and privately. Social media is helpful for conveying information publicly, and seeing what others are conveying publicly. Both are more efficient than their predecessors – snail mail, bulletin boards, etc. But their place in life will be limited – to my stationary computers. There is freedom in limitations. Cattle frolick in a fenced-in field. Children shamelessly play, within the loving and accepting confines of their home. Spouses enjoy a special intimacy that comes with commitment. Parents can enjoy watching their children grow, as they let go of their own plans for the time being. Workers can enjoy efficiency and productivity, as they narrow and specialize their career focus. Mature adults learn to take themselves lightly, accepting who they are, and what they will never be. And hopefully, I will hear God’s voice more clearly, as I limit other ones. Is there a way that you could create space for God to work in you?